Without serving the eternal Guru jeea kae bandhanaa - this jeea - this soul is tied down by bandhanaa - bandhanaa literally means the cage, the shackles. This soul is prisoned. We may be walking around on this earth but we've all got a prison inside. What is that prison made out of? It is made out of anger, it's made out of ego, it's made out of desires, it made out of greed. All of these things build up a prison inside. Gurujee says if you want to break out of that prison, out of those shackles the only way of doing is by serving the eternal Guru. Is the eternal Guru pleased with offerings of wealth, offerings made out of ego? We know out of history that even when Guru Gobind Singh Jee Maharaj was offered a diamond by the emperor of India, Guru Gobind Singh jee Maharaj knew that that diamond was being offered in ego and cast that diamond in the river Godavari. Guru piareyo Guru is not pleased by offerings of wealth or beauty or fame, Guru is only pleased by true love. Guru Gobind Singh Jee Maharaj jee says in their baani Akaal Ustat: Saach keho sun laehu sabhai jin praem keeou thin hee prabh paaeiou. O people of the world, jin praem keeou - those who've loved God truly with their heart, mind and soul they are the ones who find God. Gurmukh piaareyo serve God lovingly; follow the words of the Guru, the words of the Gurbani - that is the true service of the Guru. Vich houmai karam kamaahi - those people who are stuck inside this prison of ego, of hatred, of greed, all of their karam, all of their actions are tainted by houmai - by ego. Without serving the true Guru and we've talked about how to serve the true Guru, by meditating upon Wahegurujee's naam - Wahegurujee's name, by reading Gurbani, by following the Guru's mat - the Guru's wisdom, by walking upon the Guru's path, thour n paavehee - Guru sahibjee says you'll not find thour - any place of rest, any place of stability, any peace without serving the Guru, without following this path. Thour n paavehee - without serving the true Guru there is no thour - there is no rest. Mar - we die janmehi - we are born, aavehi - we come onto this earth, jaahi - we will leave. 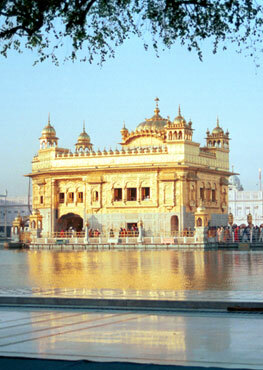 Gurmukh piaareyo this is where we have to ask ourselves are we truly serving the Guru. Bin sathigur saevae - without serving the true Guru fikaa bolanaa - all of your words are full of bitterness. That sweetness of the Guru's shabad, we read about it in gurbani, mith bolarraa jee har sajan suaamee moraa - my Lord God is mith bolarra - speaks sweetly, that Gursikh who walks upon Guru's path also speaks sweetly. That Gursikh who is truly following the Guru's words, who has truly understood and taken in Guru's words also speaks sweetly. So Gurumukh piaareyo we have to assess where are we walking? How far are we on the Guru's path? We have to assess our daily actions. Bin sathigur saevae - guru jee says those who do not serve the true Guru fikaa bolanaa - their words are full of bitterness. Naam n vasai man maahi - the Naam of God cannot come to abide within your mind. If your tongue is full of bitter words then the word of God cannot abide in your heart. The name of God can only come to abide in your heart if you serve God truly. As we've discussed before serving the Guru means following what the Guru says, following the Guru's math - the Guru's wisdom, living your life according to Guru's wisdom, according to Guru's math, according to Gurbani, reading Gurbani, researching Gurbani, understanding Gurbani, listening to Gurbani, reading Sehaj path, reading Sukhmani Sahib, reading Japjee Sahib, understanding Sehaj path, understanding Sukhmani Sahib, understanding Japjee sahib. This is the way name of God will come to abide within your heart. If you do not serve God, the true Guru your words will remain bitter. If your words remain bitter then the sweetness of God's name cannot permeate your heart. Without the serving the true Guru, the eternal Guru jam pur badhae maareean - you are tied down with your own ropes of hatred, anger, greed; they tie you down and you are maareean - you are punished, jampur - on the path of death, muhi kaalai - faces are blackened? How is the face blackened? What does that mean? We are dishonored, we come on to this earth to gain the profit of God's name and leave without that profit, outh jaahi - we simply get up and leave. Give up aisee - that reeth - give up that ritual, reeth can mean that way of life, give up that way of life, give up that path jith mai piaaraa veesarai. Give up all of those things which make you forget piaaraa - your beloved Lord God. In our daily life sometimes there are things which are leading us off the path and we know they are leading us away so Guru Naanak Devjee says if you know this thing is leading you away from Waheguru then don't walk down that path. Sathiguru Naanak Devjee says saaee bhalee pareeth - that love is bhalee - is blessed jith sahib saethee path rehai - that love which encloses you with God's love, that love which takes you closer to the Guru, jith sahib saethee path rehai - that your honor remains preserved with Lord God, what does that mean that your honor is preserved? That love for your Lord God is blessed, that love for your Guru is blessed because that love enjoins you together. That love which dishonors you, which breaks you, which breaks down the relationship between you and God, that worldly love, Guru Naanak Devjee says jaalo aisee reeth - give up that type of worldly love, that worldly attachment. Guru Naanak Devjee says on this day that take the true love of God into your heart and that is bhalee preeth. Now Guru Raamdaasjee speaks to us in the pourree. Saeveeai - serve that eik dhaathaa - that giver to the whole world, har eik dhiaaeeai - meditate upon that One. Only mangeeai - only go and beg from one Lord God, do not beg from the world. If you only beg from that One Lord God, if you only hope from that One Lord God then you'll find the fruit of Your mind's desires. If we go and beg from anyone else thaa laaj maraaeeai - then we destroy ourselves with laaj - with dishonor, with shame. Our SGGSjee Maharaj is the King of all kings if we cannot go and beg from SGGSjee Maharaj, if we are begging from mere human beings what does that say about us? Gurmukh piaareyo the Guru is saying to us today that if your father is so great then only shame can come by begging from others. Those who've served the guru with their mind, body and soul thin fal paaeiaa - they've received the fal - the fruit of their service. This jan kee sabh bhukh gavaaeeai - of those humble servants, all of their hungers are gone. They've no hunger for fame, they have no hunger for money, they have no hunger for anything. Siri Guru Raamdaasjee says I am a sacrifice to those Gursikhs jin anadhin hiradhai - who day and night in their hiradhai - in their heart, har naam dhiaaeeai - meditate upon the naam - the name of Lord with their heart. Siri Guru Raamdaasjee Maharaj is telling us, Siri Guru Amardaasjee Maharaj is telling us, Siri Guru Naanak Devjee Maharaj is telling us gurmukh piaareyo jaalo aisee reeth - give up those things jith mai piaaraa veesaray - all of those actions which break you from the Lord. Naanak saaee bhalee pareeth jith saahib saethee path rehai - practice, those actions, gurmukh piaareyo serve the Guru, read the Guru's baanee, wipe the jooray of sadhsangat, apply the dust of saadhsangat to your forehead and ask the Guru on this day, O Siri Guru Raamdaasjee maharaj, O Siri Guru Amardaasjee Maharaj, O Siri Guru Naanak Devjee Maharaj bless me that may I be joined to Your charan - to Your Lotus Feet.